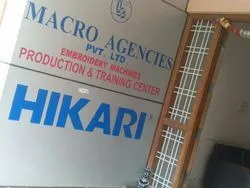 Since its inception in 1992, 'Macro Agencies' is engaged in supplying of a wide range of Embroidery Machines, Apparels, Knitwear, Leather, Textile and Label Machines and related Accessories. We are one of the pioneer dealers of large scale, commercially used Embroidery Machines in the country. We are an ISO 9001: 2000 certified organization that delivers high quality products and services. Being a client centric organization, we aim to provide our clients with the highest quality products like Single Head Automatic Embroidery Machine, Dual Function Automatic Embroidery Machine, Multi Head Automatic Embroidery Machine, Super High Speed Flat Multi Head Automatic Embroidery Machines, Hikari Sewing Machines, Computerized Bartacking Machine, Compact Label Printing Machine, Garment Label Printing Machines, Digital T – Shirt Printing Machine, Automatic Label Cutter, Ultrasonic Rolling (Welding) Cutter, Infra - Red Drying Machine and Flexo Plate Making Machine.etc. Our range of products is therefore, procured from well renowned and certified vendors across the globe. Our aim is to expand and emerge as a leader across a wider platform. Under the guidance of our CEO, Mr. V. Nagarajan, our organization has made tremendous growth. He is a Master’s degree holder in Economics and Business Management and has undergone an extensive formal training in textile industry in Japan, Korea and Germany. His vast experience has helped us understand the changing trends of the industry and helped us in staying ahead of our competitors. Moreover, his vast experience of the industry, both in India and abroad, has enabled us to adapt and bring superior technology from across the globe for our clients in India. We are one of the prominent names in the textile industry involved in providing a range of Embroidery Machines, Apparels, Knitwear, Leather, Textile, Label Machines and Accessories. These machines include Single Head Automatic Embroidery Machine, Dual Function Automatic Embroidery Machine, Multi Head Automatic Embroidery Machine, Super High Speed Flat Multi Head Automatic Embroidery Machines, Hikari Sewing Machines, Computerized High - Speed Bartacking Machine, Compact Label Printing Machine, Digital T - Shirt Printing Machine, Automatic Label Cutter, Ultrasonic Rolling (Welding) Cutter, Infra - Red Drying Machine and Flexo Plate Making Machine. Further, our branches are conveniently located in various cities like Tirupur, Chennai, Mumbai and Secundrabad. From these offices our clients can avail after sale support for maintenance and restoration. With the intention of well serving our clients, we have associated ourselves with only the best manufacturers. Our range of products is brought from well renowned and certified manufacturers from various countries like Korea, Japan, Hong Kong, Taiwan, Germany and U.S.A.
M/s.Kwong Hop Label (H.K,) Ltd. Hong Kong. Japan Industrial Machinery Corporation Etc. In all our operations we are backed by a well experienced and dedicated group of professionals. Our group of experts has been trained abroad and boasts of wide experience. Based on their expertise, our organization has associated itself with manufacturers producing high quality machines. 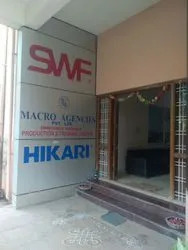 Under the knowledge of our adept team, we have established our branches in various cities that provide technical assistance and after sale support to our clients. We are the authorized technical consultants for many international manufacturers like M/s.Sunstar. Precision Co., Ltd. Korea, M/s.Kwong Hop Label (H.K,) Ltd. Hong Kong, M/s.Proel CRL Italy, M/s.Salli International Ultrosone, M/s. Brother Industries Ltd. and Japan Industrial Machinery Corporation Etc. We are pioneers in providing an in-house Training Centre that imparts training on operation and maintenance of machines, design development and training of design software.